Play out all kinds of enchanting tales with these enchanted friends, and collect them all to build out a world of Enchantimals (each sold separately, subject to availability). 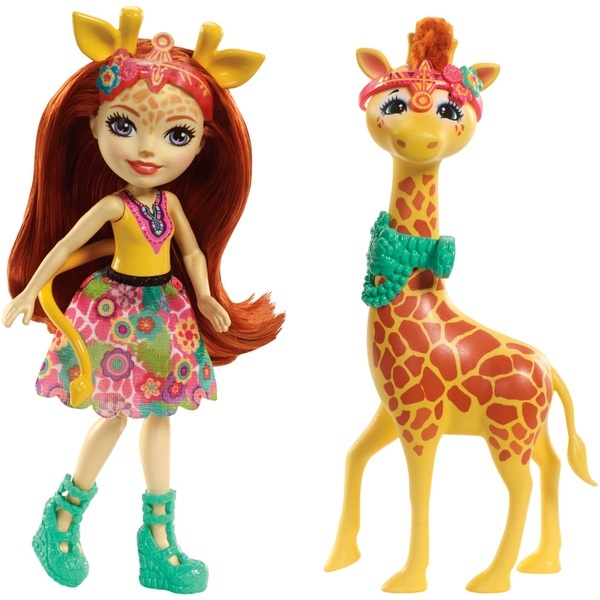 Imaginations ride into an enchanted world with the Enchantimals doll and animal sets, like Gillian Giraffe doll and her large giraffe friend Pawl figure. The Enchantimals dolls are lovable characters who share a special bond with their animal friends they're always together, and they look alike, too. Plus, Pawl giraffe friend is big enough to ride! Gillian Giraffe doll wears a colourful outfit with removable skirt, shoes and headpiece. Giraffe-inspired ears poke from her rooted red hair. Pawl giraffe has cute touches and unique accessories of its own, like furry hair detail, decorated reins and a matching headpiece. Kids will love recreating the special bond the friends share and celebrating a world where Caring Is Our Everything. Collect them all to build out a world of Enchantimals and tell enchanting stories of your own (each sold separately, subject to availability).